Keep the tear staining to a minimum with regular maintenance. If you are saddened by the unsightly tear stains plaguing your prized Pomeranian’s face, you’re not alone. This is an unfortunate malady that many small dog owners face because of the dog’s facial structure. There are some techniques that you can implement to help get rid of those tear stains. Hold your Pomeranian in your lap and pet her. This will help relax her and hopefully keep her from squirming too much while you work on her tear stains. Have your supplies within reach and remember to praise her for good behavior, as well as offer small treats. Wet a cotton ball or pad with warm water. Wipe the eye area from the inside outward. Use a different ball or pad for each eye. You can clean the area daily in this manner or as often as is needed. This works for minor staining. Mix 1 part hydrogen peroxide with 10 parts water in a glass or ceramic bowl to work on more stubborn stains. Dip a cotton ball or pad in the solution and wipe the eye area, changing balls or pads frequently. Always start from the inside and work toward the outside. Take extra caution to keep the solution out of the actual eye, as this would just cause further tearing and irritation. That’s why it’s a good idea to relax her and keep her calm while you work. 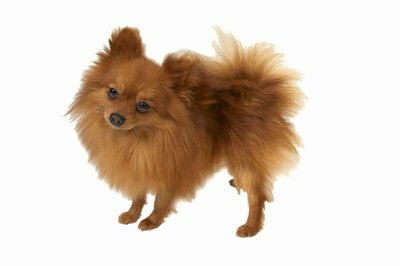 Take your Pomeranian to the groomer regularly to have the hair around her eyes trimmed. This will keep the hair from irritating the eyes and causing excessive tearing. Visit the vet if the staining is persistent or you suspect that the tearing is a result of infection, inflammation, blockage, allergies or injury. He will be able to give you a proper diagnosis and prescribe any medications needed, as well as answer any questions you may have. There are over-the-counter products that you can find at the pet store that are specifically designed to help remove tear stains.